The ACC is loaded with talented quarterbacks these days, and the guy with perhaps the most impressive stat line of any passer in the country is flying way under the radar. Mitch Trubisky didn’t come into the season as the preseason Heisman favorite. That was Clemson’s Deshaun Watson. He also isn’t the current top guy on all the Heisman lists. That’s Louisville’s Lamar Jackson. He’s not even the guy many were touting as a first-rounder in next spring’s NFL draft. That’s Miami’s Brad Kaaya. Trubisky, though, is the guy who just shredded the FSU defense and snapped the Noles’ 22-game home winning streak, which had been the longest in the country. 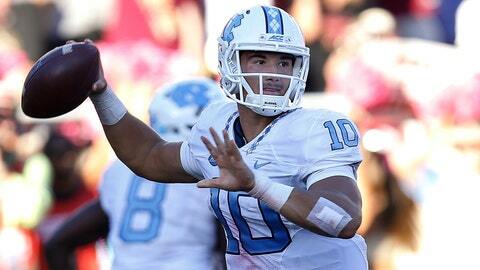 Trubisky went 31-of-38 for 405 yards with three TD passes against the Noles, sparking a 21-0 lead. He also ran for a fourth touchdown as UNC won 37-35. “It was huge for our program and huge for our kids,” head coach Larry Fedora told FOX Sports Sunday, praising his team’s resilience and grit. “This was a huge accomplishment for our football team." The win moved the Tar Heels to 4-1 and vaulted Trubisky into my Heisman Top 5. Anyone who scoffed at seeing his name up there should start by looking at the jaw-dropping numbers the 6-foot-3, 220-pound junior is putting up. He’s completing 76 percent of his passes and has a sterling 13-0 TD-INT ratio. He’s also run for four touchdowns. Fedora’s groomed more than his share of gifted QBs. He said Trubisky is a combination of all the best attributes of his top proteges. Trubisky is level-headed and calm the way former Florida standout Chris Leak was. He has a big arm like former first-rounder Rex Grossman had. He has the same kind of “unbelievable will to win” that former Southern Miss star Austin Davis had, only Trubisky has a bigger arm. He has the kind of wheels to challenge defenses like former UNC starter Marquise Williams had, except Trubisky, a low-4.6 40 guy, is even faster. Trubisky showed glimpses of this kind of performance last season in limited action behind Williams. He completed an astounding 85 percent of his passes and threw six TDs and zero picks. He also averaged a gaudy 11.81 yards per attempt. Fedora said that seemingly unflappable presence is comforting to his teammates. It certainly had to have been as UNC rallied for the game-winning field goal in the final minute of the game after seeing their three-touchdown lead chased away in Tallahassee. 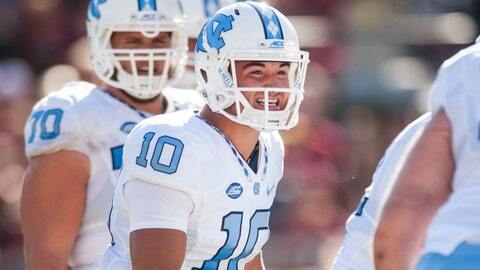 Fedora’s most proud of how well Trubisky has taken care of the ball, he said. Trubisky’s talents suit the UNC offense well. This year, the Tar Heels have emphasized their drop-back game a little more, but they still rely heavily on their play-action game. Fedora adds that even though Trubisky is completing passes at a staggering rate, it’s not like he’s just throwing all bubble screens. Against Pitt, where he went 35-of-46 for 453 yards and five touchdowns, Trubisky took — and connected on — a bunch of downfield shots. Against FSU this weekend, he didn’t go downfield as much but that was because the Noles were playing their safeties a lot higher and not involving them in the run game. Instead, Trubisky just burned them with a lot of intermediate stuff and underneath throws. “He’s just very heady,” said Fedora. "He makes good decisions, he doesn’t get flustered and he really can do it all." Up next: Trubisky and the No. 17 Tar Heels host No. 25 Virginia Tech, where DC Bud Foster will likely have a few things ready to make things rough for the rival QB. 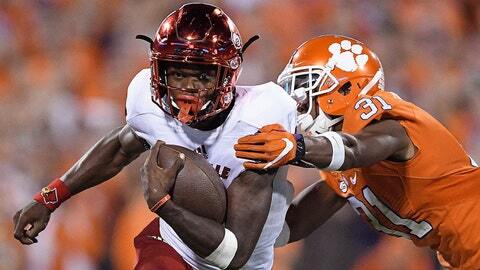 Louisville lost the biggest game of the first month of the season, but the Cards and Lamar Jackson were very impressive in a charged environment. Louisville piled up 363 yards of offense in the second half and almost took down my preseason pick to win it all. I definitely wouldn’t write the Cards’ chances at a playoff spot off. I dropped them down to No. 6 in my Top 10. I expect them to cruise through the rest of their ACC schedule, but they still have a big road test in November on a Thursday night against what likely will be a Top 10 Houston team. If U of L wins out (and Clemson does, too), an 11-1 Louisville team figures to be in decent shape. My hunch is the Big 12 won’t have an undefeated conference champ. The Cards can knock Houston out of contention. Then they’d need one of the other three Power 5 leagues (Big Ten, Pac-12 or SEC) to end up with a two-loss champ. Word is first-year Georgia head coach Kirby Smart is struggling with his overall management style of the football program and its effect on the operational aspect of the team. The Bulldogs are 3-2, and though this is a rebuilding project where the Nick Saban disciple has an inexperienced true freshman QB, an underwhelming O-line and only one starter back in his front seven, this is an issue worth keeping eye on. Charlie Strong has taken over play-calling duties on defense from DC Vance Bedford at Texas, as I’d reported over the weekend. It’s certainly not a good sign of the direction of how things are going for the third-year UT head coach. Pressure is mounting with the big rivalry game against OU up next. Strong has a talented young team that struggles on the road although they’re handling the road better than they did last year — which is to be expected from an inexperienced bunch. It’s worth noting that three of the QBs who have shredded Texas — ND’s DeShone Kizer, Cal’s Davis Webb and Oklahoma State’s Mason Rudolph — are probably three of the six or seven top NFL quarterback prospects in college football this year. Regardless, the heat on Strong is very real, I’m told by sources at Texas. The feeling there was if he went 7-5 this season, he’d probably be safe. Now, it’s looking like Texas needs to get to 9-3. And even then, that might be enough, according to one source on Sunday. LSU and Tom Herman, answered the source. IF Strong can survive this season in Austin, I think the job won’t come open for years. Whomever is coaching this team in 2017 will have a loaded squad. And yes, Texas is a better job than even LSU. The ACC is really deep at QB. Trubisky is at least starting to get noticed. The guy really flying below the radar is Justin Fuente’s latest, Jerod Evans, a one-time Air Force recruit who in his debut season at Va. Tech is completing 67 percent of his passes and has thrown 13 TDs and just one interception. The battle this week between he and Trubisky isn’t Lamar Jackson-Deshaun Watson, but it’s definitely one we’re looking forward to. 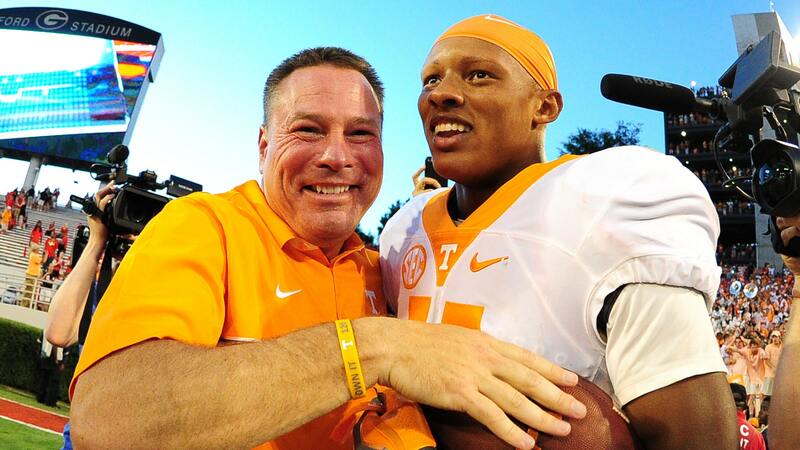 I’ve been on the Vols’ bandwagon for awhile now and my trip there in the spring only sold me that much more on UT this year because of the leadership in their locker room Two of those guys really have shined the past few weeks in DE Derek Barnett and QB Josh Dobbs. Still, Tennessee has got to find a way to start faster. In first quarters, UT has been outscored 41-10, and that’ll probably catch up to them now that they have their two biggest tests of the regular season up next: at Texas A&M and then against Alabama. Then again, for a program that for much of the past decade has been its own worst enemy and couldn’t help but keep shooting itself in the foot, after the past two crazy weeks it’s starting to feel like this team has taken on a similar vibe to that Auburn squad that went to the BCS title game a few years ago. With all of the attention Tom Herman is getting at Houston, his DC Todd Orlando doesn’t get enough credit. But Orlando is a big reason why the Cougars have a pretty unique statistical claim. The Cougars are the only team nationally with more points scored (221) than rushing yards allowed (210). Baylor has gone for it on fourth down 14 times in five games — sixth-most in the country. That’s actually twice more than Jim Grobe’s team went for it in all of 2013. Blame it on the rain? Washington leads the nation in fewest punt return yards allowed at minus-2.33 yards per return. Wazzu is second at minus-1.33 yards per return. Last year, the Huskies were No. 41 and the Cougars ranked No. 123 in the country. This one is courtesy of NFL draft maven Gil Brandt. Over the past three years, Stanford is 7-1 against the spread in games played in California, but now just 4-9 when they travel outside the state.